"This hearty beef and vegetable stew that can be made in the slow-cooker is a family favorite. It is also the backbone for an excellent beef soup, if you actually find yourself with leftovers." Pour red wine into the pan; bring to a boil while scraping the browned bits of food off the bottom of the pan with a wooden spoon. Continue cooking the mixture until the wine evaporates, 7 to 10 minutes. Stir tomatoes into the mixture. 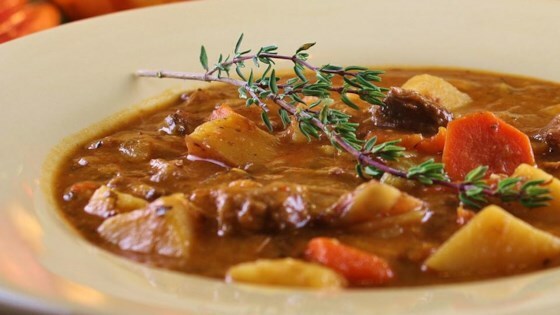 Wow yourself with this hearty beef stew. To create a soup from this stew, chop up vegetables and beef pieces into much smaller pieces and add vegetable stock or water until it resembles a soup. Simmer briefly, but not too high as it will make the soup extremely cloudy.